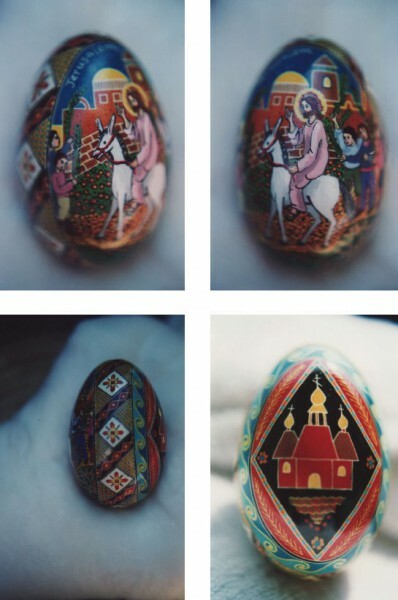 Renata Bernal has created a series of eggs that uniquely combine the traditional pysanki (wax-resist) design and decoration method with her own painting style. The front oval image is a depiction of a traditional religious scene (appropriate to the Easter season) painted in egg dye, while the borders and back of the egg are traditional Ukrainian patterns and designs created using the classic wax-resist method. This specific egg depicts Jesus riding into Jerusalem on a donkey, with the people laying down palm branches in front of him.